Size: Adult - 1/2" to 1", larva - 1" to 1 1/8"
Identification: These caterpillars are pale yellow or beige, black-spotted, and covered with hairs. Adults are pure satiny white to dusty brown moths. 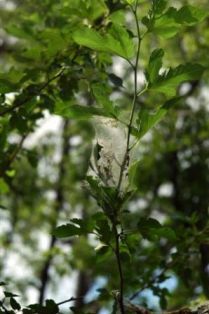 The larvae form loose, dirty white webs on terminal tree growth from spring through fall. 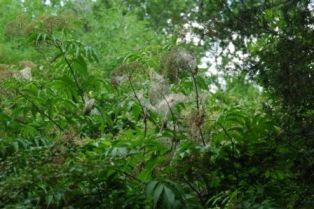 They eat the foliage within the web. Biology and life cycle: Pupae overwinter in cocoons in the soil or tree bark. 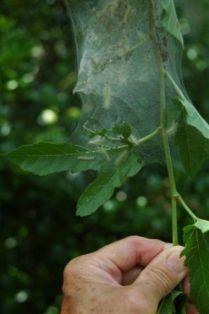 Adults emerge in early summer to lay eggs in large masses on the undersides of leaves. Eggs hatch after a few days and larvae feed as a group for about four to six weeks in mid-summer. White or pale yellow cocoons form in July. Can be several generations a year. Habitat: Pecan, ash, willow, persimmon, hickory, apple, walnut, mulberry, and other deciduous trees. 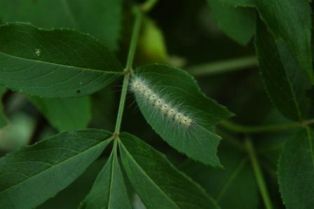 Feeding habits: Larvae eat outer foliage of trees, especially pecans. They eat fast and furious and create an ugly mess in the foliage of trees. 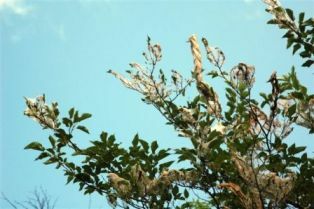 Economic importance: The damage to trees ranges from unsightly entangled webs and partial defoliation to complete defoliation which can badly stress trees. Natural control: Protect the wasps, the birds, and the assassin bugs because they eat webworms. Tear webs with a fishing pole or pole pruning saw to allow the native wasps to control the pest. Release trichogramma wasps as new foliage emerges in the spring or later if weather is allowing additional hatchings. Organic control: Spray Bacillus thuringiensis or plant oil products, always at dusk, as a last resort - just on the plants under attack. Use one tablespoon of molasses per gallon of spray. Catch larvae in sticky tree bands. Active worms can also be killed with any of the citrus-based sprays. Spinosad products can also be helpful. Insight: We have noticed an increase in this pest in direct relationship to the popularity of chemical lawn care companies and the use of aerosol wasp-killer sprays. Killing the beneficials has given the webworms a free rein. 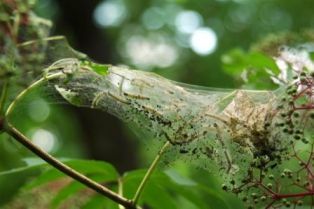 Webworms and all other larvae of moths and butterflies can be controlled, if they need to be, with safe organic techniques. Webworms, tent caterpillars, loopers, green worms, sod webworms, army worms, leaf rollers and other caterpillars can be killed effectively with a spray of any of the Bt (Bacillus thuringiensis) products. For the best control, add 1-2 ounces of molasses per gallon of spray. Even better is to prevent them from becoming a problem in the first place by releasing Trichogramma wasps.